results from the pancreas's failure to produce enough insulin due to loss of beta cells. This form was previously referred to as "insulin-dependent diabetes mellitus" (IDDM) or "juvenile diabetes". The cause is unknown. begins with insulin resistance, a condition in which cells fail to respond to insulin properly. As the disease progresses a lack of insulin may also develop. This form was previously referred to as "non insulin-dependent diabetes mellitus" (NIDDM) or "adult-onset diabetes". The most common cause is excessive body weight and insufficient exercise. is the third main form, and occurs when pregnant women without a previous history of diabetes develop high blood sugar levels. 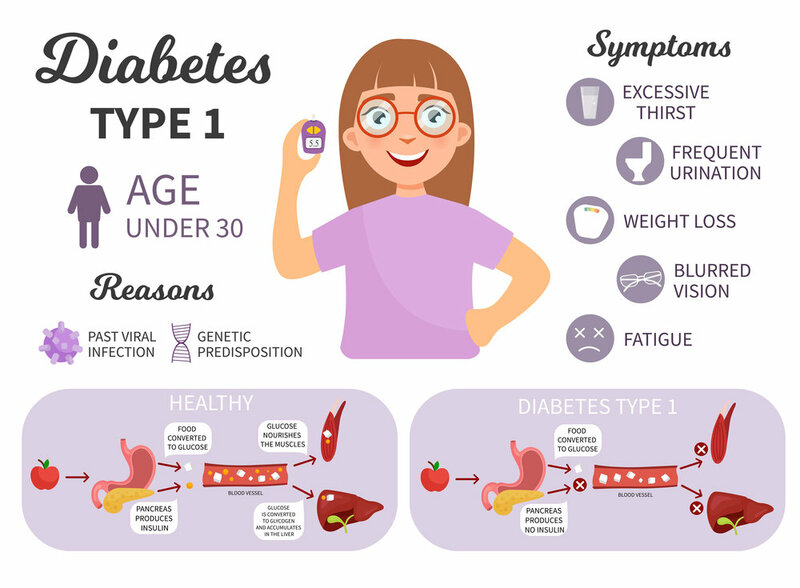 Symptoms may develop rapidly (weeks or months) in type 1 DM, while they usually develop much more slowly and may be subtle or absent in type 2 DM. Prolonged high blood glucose can cause glucose absorption in the lens of the eye, which leads to changes in its shape, resulting in vision changes. A number of skin rashes that can occur in diabetes are collectively known as diabetic dermadromes. Diabetes is growing fast among Blacks and Hispanics. Prevalence of diabetes among African Americans is about 70% higher than among white Americans.